Philabundance is a non-profit organization that helps to get healthy, nutritious food to the needy in nine counties the Delaware Valley region of the USA, where up to a million people face hunger every day. As with other organizations doing great humanitarian work like this, EC Software supports Philabundance with a full suite of non-profit licenses for the Help+Manual program and its template pack. This helps them to centralize their information and make it accessible to their staff quickly and efficiently. Philabundance has generously agreed to provide a short description of their Help+Manual deployment, which we are happy to publish here. Philabundance is the Delaware Valley's largest hunger relief organization serving 9 counties in Pennsylvania and New Jersey. 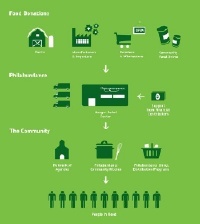 Through a full plate of services, Philabundance provides food to 75,000 people in need each week. Our dedicated staff works with corporations, foundations, individuals, the food industry, manufacturers and importers and farms to provide people in need with access to free nutritious food. Our direct neighborhood distribution programs were established to improve access to nutritious food staples to those struggling to put food on the table. In addition, we work with a network of nearly 500 food cupboards, shelters, emergency kitchens that get food into the hands of neighbors who need it most. In September 2013, Philabundance opened Fare & Square, the nation's first non-profit grocery store of its kind, to provide access to healthy, affordable food, job training, employment, and outreach services to the city of Chester, PA, which until then had been without a full-service grocery store since 2001. Shortly after opening, it became clear that Fare & Square needed a tool to ensure data integrity in its receiving process. Often, issues arose in the course of identifying fields on an invoice and entering them correctly in the system. While the first attempt of simply writing Word documents to document the process was a tenable start, it was not a sufficient long-term solution to the problem. We needed a very detailed, step-by-step document that could show where the process flows branch and recombine in multiple places. Using Help+Manual, we wrote and created a manual for receiving deliveries and entering a high volume of invoices from multiple vendors on a daily basis. As opposed to a simple linear Word document, Help+Manual enabled us to create a help manual that can start with the vendor and then walk the user through all the data they need to identify on the invoice as well as how to key the data into the system. There is a high level of repeated steps between different vendors and using snippets, H&M allowed us to rapidly reuse common steps and images without having to cut and paste. More importantly, to update a process used in multiple places, we only had to edit it in one place. In addition, Help+Manual allows us to publish in multiple formats such as PDF and CMS help file. This permits us to have the paper version of the documentation for off-line review as well as a live screen help file for operational use side by side with the staff doing the data entry. We look forward to leveraging all of the great features Help+Manual has to offer for future process documentation in our mission to drive hunger out of our communities.